Philippa Ballantine’s DIGITAL MAGIC, J. Daniel Sawyer’s FREE WILL AND OTHER COMPULSIONS, and Chris Lester’s METAMOR CITY SEASON 2 have been unleashed upon the world. You’ve heard the first episodes, now talk to the authors. We will all be live on Talkshoe this evening, 6pm PST, taking your calls and chewing the scenery. Contests will be had — prizes will be given — insanity will rule the day. 6 PM Pacific Time: Dan Sawyer & Pip Ballantine begin the LIVE Triple Threat Launchcast event at TalkShoe <–link leads to the show. 8 PM Pacific Time (est. ): Chris Lester joins the Launchcast. 7 PM Pacific Time: Chris Lester, Dan Sawyer, Kitty Nic’Iaian and Gail Carriger record the first feedback show of the new season of Metamor City! Send in your responses to the new episodes and we’ll include them in the show. It’s all on- so hope you can join us! 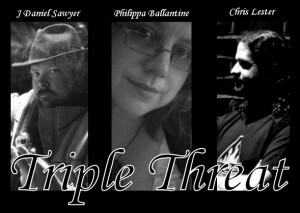 Tagged Chris Lester, Philippa Ballantine, Triple Threat.